Next Gen Dine mobile point of sale by Prelag Partners LLC is now available in the App Store. Next Gen Dine restaurant point of sale by Prelag Partners LLC is now available to download on the Apple App Store. 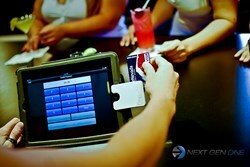 Customers can use Next Gen Dine point of sale app from their iPhone, iPad, or iPad Mini. Next Gen Dine is accessible from anywhere as long as there is an active internet connection through a mobile network or through Wi-Fi. Customers of Next Gen Dine can easily download the app and install on their Apple device. Next Gen Dine is exclusively available on the App Store, but will be soon available to download on Google Play and Windows Store. Making tableside orders and payments, Next Gen Dine is the future of restaurant dining. For more information about the product or to find out how your restaurant can take part of Next Gen Dine, contact Paul Roberts, Managing Partner at 1-877-342-2218 or paul(at)nextgendine(dot)com. Follow us on Twitter, Facebook and LinkedIn. To learn more about Next Gen Dine and services offered, please visit the company’s website at http://www.nextgendine.com.